Newbery Medalist Karen Hesse immerses readers in a small Vermont town in 1924 with this haunting and harrowing tale. 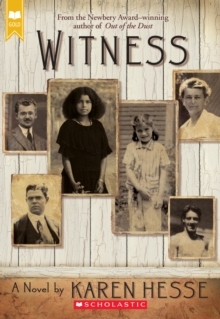 Witness joins the Scholastic Gold line, which features award-winning and beloved novels. Includes exclusive bonus content! These characters are among the unforgettable cast inhabiting a small Vermont town in 1924. A town that turns against its own when the Ku Klux Klan moves in. No one is safe, especially the two youngest, twelve-year-old Leanora, an African American girl, and six-year-old Esther, who is Jewish.